Hybrid Kit for 1080 Ti FE ? Holy cr@p - just saw that too - it wasn't $179.99 a few hours ago, I think it was $129.99. I wonder if it's been bumped up because EK have said they will delaying their system for a few months. Hope this is a typo.. You might get their money EVGA, but it'll probably be the last time you ever do for some. It was $119.99. What the hell. Better be a screw up. Exactly. It was $119.99. They increased the price 50% for essentially a functionally identical product. They've even reused the media materials from the 5188 model. We need an explanation that doesn't resemble gouging. For that price I'm taking my money elsewhere, There's making a profit and then there's greed. You guys can express how you feel about the price, but please watch your language when expressing how you feel about the price. Thanks. :( What's up with the price change?! Price went up to $180? Was definitely in at $120. Probably not at $180. Firestrike Ultra - 7525 - http://www.3dmark.com/3dm/19641581? I see a 5188 and a 5388. I know. And I see, $119.99 and $11....no wait, $179.00! And the product specs are identical. Yet for some reason, the 5388 price was increased 50%. Sure would be nice to know why. I know. And I see, $119 and $11....no wait, $179! And the product specs are identical. Yet for some reason, the 5388 price was increased 50%. Sure would be nice to know why. I was just told it was a 5 minute job to modify the 1080 kit... if that holds true it would be worth it. Especially since the warranty on the AIO is only a year. Don't need to mod anything at all unless you want the full shroud cover on it (for the Titan XP at least). 1080Ti needs mod otherwise the plate won't sit due to VRM's iirc. This is what I don't get. They copied the media material from the 5188 INCLUDING the shroud that won't fit the 1080 Ti and increased the price 50%. 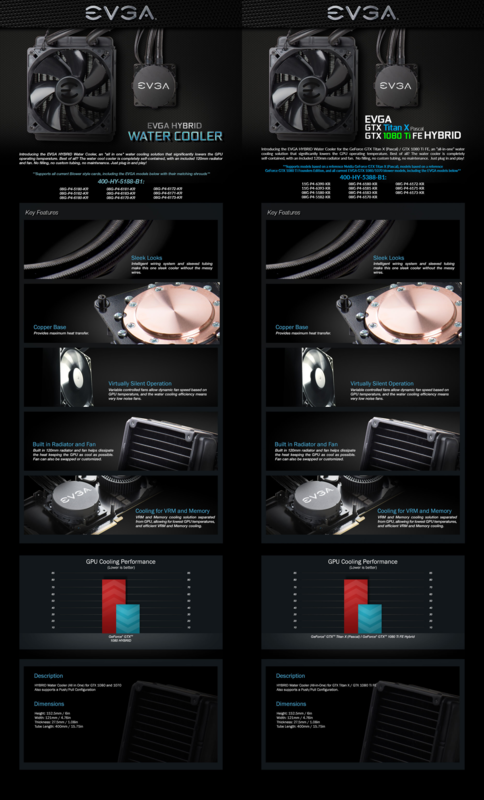 Someone needs to have the marketing dept at EVGA stop with the liquid lunches. You're correct, the shroud channels the air and makes a significant difference. 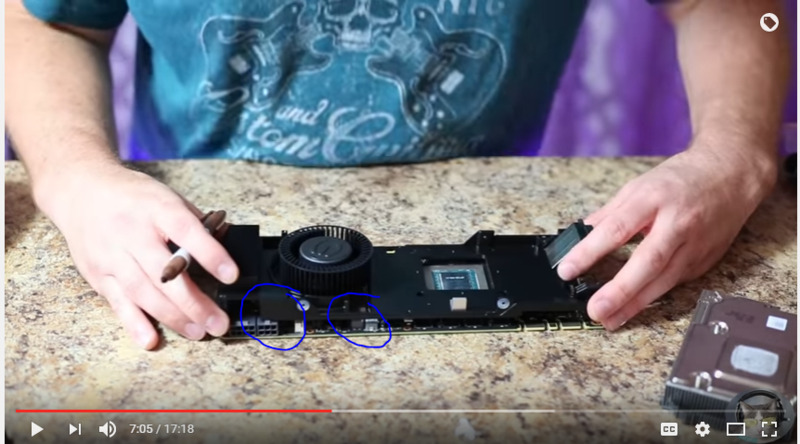 I'm just going by the video from Gamers Nexus where they claim the VRMs on the Titan XP run within spec even without half the shroud (note the fan is still there though). Also for the last 8 months or so we've had little choice for the Titan XP but to get creative while at the same time trying to keep the original shroud in one piece and not physically modded for resale/warranty reasons. SO, the question is when? "next week" lolz.. yeah, who the hell knows. The only difference between the 1080 hybrid and the 1080ti hybrid are the mid plates. Pardon my ignorance, but does this hybrid cooler fit any founders edition? I just got an asus founders and its 83c the entire time while gaming. I have 30 day to exchange it, as of now they don't have any evga 1080 ti in stock at my local micro center. Yes, It will fit all founders edition as the manufacturing was done to Nvidia spec without any third party alterations. Thanks for the quick reply. Now its the waiting game. No problem at all. Personally, I was kind of stoked about the hybrid kit until the pricing shenanigans occured. So here is currently what we are looking at. - Custom loop (I gauge about $315 including full cover block, pump, rad, reservoir, fittings, and tubes). Could probably be reduced if you went universal plate.